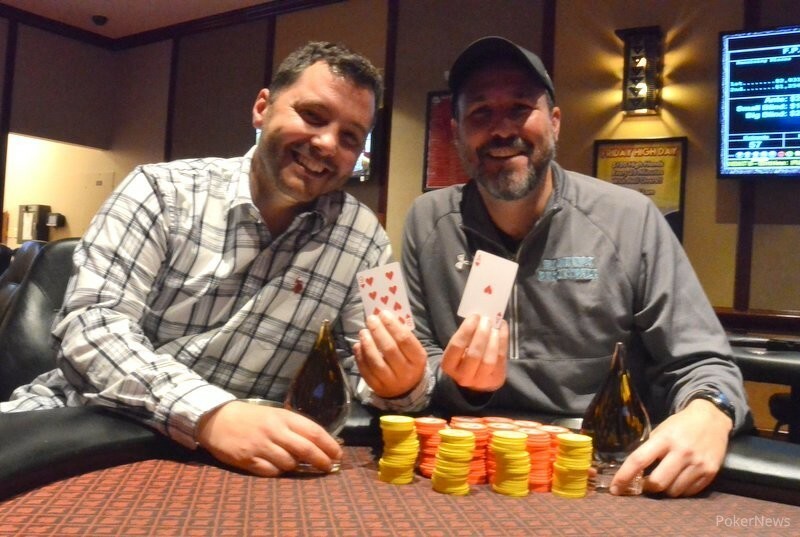 Canadians Jeffrey Roth and Jeremy McFarlane took down one half of the 2017 Seneca Fall Poker Classic Double Tag Team Event at the Seneca Niagara Resort & Casino in Niagara Falls, NY early Wednesday morning. Fellow Canadians Tim Pell and Darryl Swarts won the event's other tournament, earning $1,994 in the process. Roth and McFarlane grabbed $1,479 for their win. The uniquely formatted $120 Tag Team No Limit Hold'em event was actually two tournaments in one. Teams of two bought in to into one or both and tagged in and out or switched seats every 20 minutes. The event drew teams of all sorts including couples, friends and family. A good time was had by all as the tournaments both featured a little more of a fun and jovial atmosphere than normal. Poker can be a lonely pursuit. Team events bring people together and this event was certainly evidence of that. The two teams who won certainly left happy, but there's little doubt others did as well. 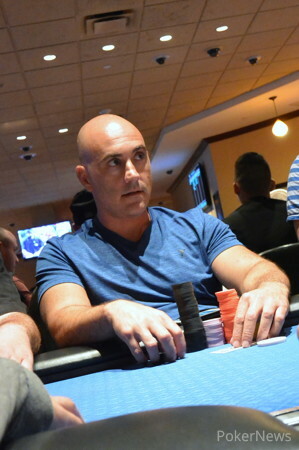 Two teams, including friends Louis Hawkins and Don Lewis, and father and son Mark and Casey Nowak, even made the final table of both tournaments. However, only Hawkins and Lewis cashed in both. For others that cashed, the money wasn't big, but the level of fun definitely was, and they all left smiling. PokerNews' coverage of the 2017 Seneca Fall Poker Classic is dark Wednesday, but continues with the $300 Pot Limit Omaha event on Thursday Nov. 9 beginning at 1 p.m.
After a bit of back and forth heads up, Jeff Roth jammed the . Alex Rivera looked down at and made the call for his team's tournament life. Roth turned an ace on a board to take it down. Team Alex Rivera - Mark Roberts takes second and the title, trophy and first-place money goes to the team of Jeff Roth and Jeremy McFarlane. A short recap of the event will follow. Sam Curto shoved a flopped pair of kings into Jeremy McFarlane's flopped pair of aces. 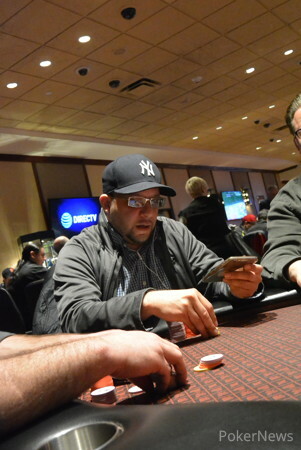 Team Rich Giambra - Sam Curto had only a few chips left. Jeff Roth and McFarlane moved into a dead heat with Mark Roberts and Alex Rivera for the chip lead. Curto busted two hands later and the two teams went heads up saving an additional $200 for second and leaving $479 for the winner. Mark Roberts got it in with king-ten versus Salvatore Guercio's sevens and found Broadway. That left Guercio with less than a small blind and out the next hand. Sal Incardona and Salvatore Guercio take fourth. The final four teams agreed to a chop. They will each earn at least $1,000. However, the winner will get and additional $679 and the trophy. Aaron Obstein ran ace-king into Jeremy McFarlane fives. McFarlane hit a set. 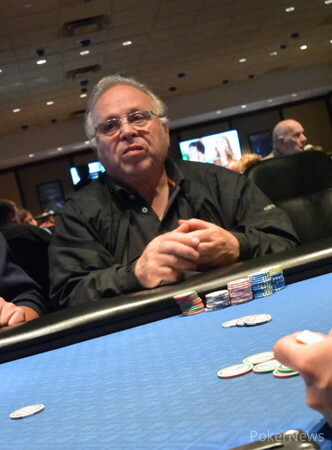 Jerry Obstein tagged in a minute later and although he doubled up once, he got it in with sixes against McFarlane's partner Jeff Roth's . Roth spiked an ace and Team Obstein took fifth. The 2017 Seneca Fall Poker Classic Double Tag Team Event Starts Now!